Pakistan’s media regulator has ordered a controversial televangelist to apologise on air for hate speech. Aamir Liaquat Hussain had accused liberal activists, bloggers and journalists of blasphemy and treachery. He and the Bol television channel which broadcasts his show have until the end of the month to say sorry to those he accused – or be taken off air. Such allegations can incite murder in Pakistan, where blasphemy is a crime that can result in the death penalty. Even the suspicion of blasphemy has seen victims attacked and in some cases lynched by angry mobs. What are Pakistan’s blasphemy laws? The regulating body, Pakistan Electronic Media Authority (Pemra), has been investigating Mr Hussain since January after it received hundreds of complaints against his show, Aisay Nahi Chalega (This is Not Acceptable). Among others he accused were five liberal bloggers who went missing for several weeks after criticising the military. Bol TV went to the courts and won the right for the programme to stay on air. The channel now has until the end of March to pledge in writing that it will not broadcast hate speech in future. It must also pay a fine of 1m rupees (£7,600: $9,540) within 15 days. 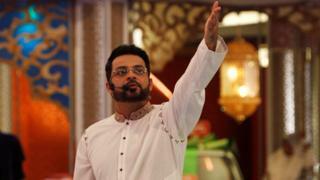 Aamir Liaquat, a former lawmaker, was criticised in 2013 for handing out babies to childless couples during a live TV broadcast. He insisted at the time that the move was aimed at saving abandoned infants and was not simply an attempt to boost his ratings. In September 2008, Aamir Liaqat dedicated an entire programme to exploring the beliefs of the Ahmadis, a sect who identify themselves as Muslim and follow the teachings of the Koran but are regarded by orthodox Muslims as heretical. In it, two scholars said that anyone who associated with false prophets was “worthy of murder”. Within 24 hours of the broadcast, a prominent member of the Ahmadi community was shot dead in the small town of Mirpur Khas.